This morning, I ran the Mardi Gras Half for the second year. Last year, I ran this race on my wedding day. I believe this gives me bragging rights for the next decade. 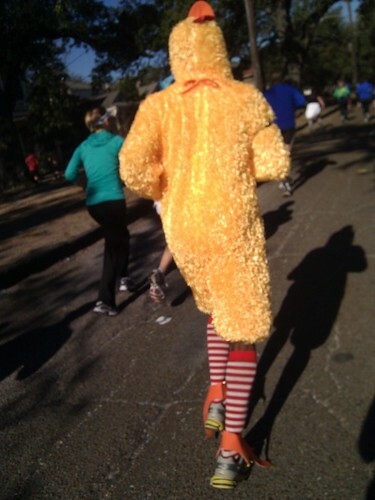 I paced with the chicken above during miles 9 and 10. Pretty sure he beat my time in the end, but I was still proud of how strong & energetic I felt at that finish line. 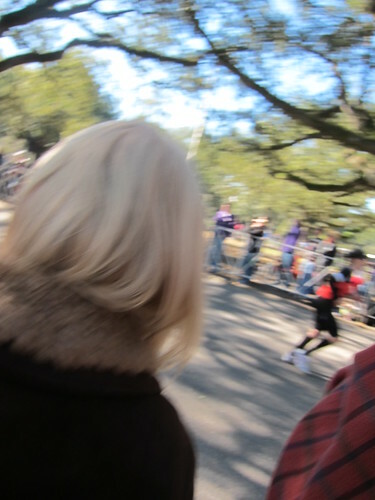 For that finale, I’d like to thank the guy at mile 12 handing out King Cake. Mr. T met me at the end and tried to snap a picture, but it turns out my decision to sprint those final 500 yards meant he caught the back of some other lady’s head. Oops. Our first order of business, post-shower, was refueling. 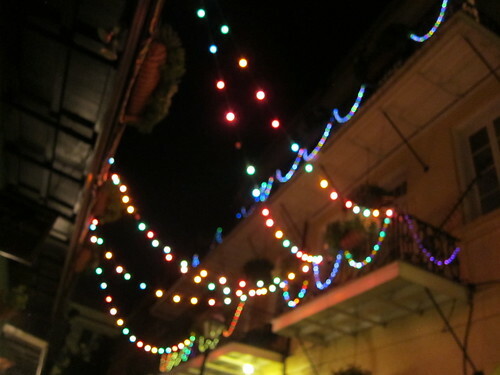 We walked down Dauphine to a new place we’d noticed Friday night, called Nosh. We had the place to ourselves. An artist walked in (apparently returning, having been invited) to draw portraits of the staff. Between getting our biscuits and gravy and whatnot, our waitress sat for him. She and the attendant side conversations were charming. Speaking of charmed, that’s how I’d describe today, where we explored the quarter in warm sunshine. Mid-afternoon, I started fretting I was coming down with Mr. T’s cold, so I napped that fear away. 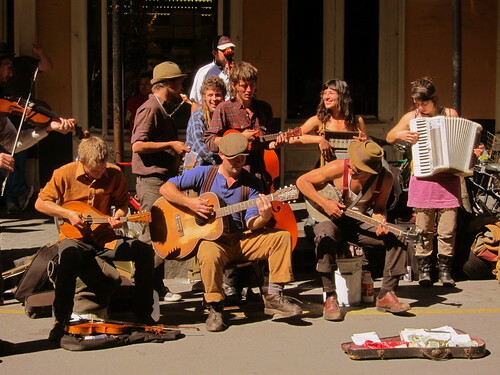 We awoke hungry, and ready to dine at a place I’d vaguely known about — The Green Goddess. I’d love to recall who might’ve told me about it first (Rocky? ), and name my next dog after him (an honor, I promise you). We had one of the top 5 meals of my life — the evening was ridiculously spectacular. We arrived before 6 and snagged the final 2 seats open at the bar. From first bite of that powerfully delicious Korean pancake, we were in for it. The mushroom bread pudding was a great savory twist on my husband’s favorite dessert — we noticed it being enjoyed at a few tables. Later, the chef delivered our Armagnac figs and encouraged us to enjoy every last drop of the brilliant Cherrywood-aged balsamico. We obeyed and were thisclose to licking the plate. Their cocktail program is worth a visit alone. My first drink (their rum sazzy) was on point, but I knew I’d found my One True Drink when the gifted bartender idly mentioned their julep (“See Rock City!) was inspired by a Ginger Mint Julep sign, only a few blocks away. I KNEW THAT SIGN! I’ve photographed that sign. I’ve wished for that drink. And here it was! How lucky were we to have found this place? 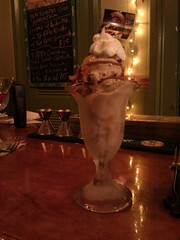 Elated from a marvelous dinner, we finished by going for their praline bacon sundae: “Pecan praline ice cream with a creamy bacon caramel sauce carrying a bit of both Pink Himalayan & Black Lava Salts, & micro-planed applewood bacon.” Oh, yeah! Korean Oyster & Scallion Pancake This classic savory pancake made of both wheat & rice flours, contains Louisiana oysters, scallions, ginger and a touch of spice, served with pickled celery root in yellow pepper remoulade, with sesame-soy dipping sauce. Mushroom Bread Pudding Several kinds of mushrooms packed into a savory bread pudding, topped with a “scoop” of La Serena sheep cheese & Oregon white truffle cream sauce. Shrimp “Wearing a Grass Skirt” Roasted Louisiana shrimp wrapped in shredded phyllo, with New Orleans barbecue shrimp sauce, roasted pineapple & young coconut slaw. Armagnac-Soaked Mission Figs These boozy morsels are stuffed with Strathdon Blue Cheese, wrapped in Serrano Ham, quick-roasted, and finished with Leonardi Balsamico aged 20 years in Cherrywood Barrels. The Notorious Bacon Sundae — made with pecan praline ice cream with a creamy bacon caramel sauce carrying a bit of both Pink Himalayan & Black Lava Salts, & micro-planed Nueske’s Applewood Bacon, layered with whipped cream, of course! My new favorite drink on the planet: “See Rock City!” Mint Julep Our exotic take on the eternal verities of the mint julep, with Ginger Syrup, Lychee Juice, muddled mint and Catdaddy Carolina Moonshine. Mr. T’s favorite: The Oregon Bog Clear Creek’s wonderful Cranberry Liqueur, from organic coastal Oregon bogs; Bruichladdich’s “The Waves” Islay Single Malt Scotch, Italian orange liqueur, & Fee Bros.Whisky Barrel Bitters. D-Day Rum Sazerac We invented this to imagine New Orleans captured by German U-boats, leaving us without any Rye whisky to make our home town Sazeracs.“Navy Strength” Smith & Cross rum, Steen’s Cane Syrup, Peychaud’s Bitters and Absinthe rinse. The Gentle Giant In homage to the giant Pacific NW ecosystem, we blend Green Chartreuse, G’vine French Gin, lime, lotus tea & a float of Clear Creek’s magnificent Douglas Fir Eau-de-Vie. Congrats on another great race. So glad you found these great meals … can’t wait to try thes places!